Nestled at the cusp of ancient and contemporary history is a sanctuary of the senses that is Dar Al-Anda. The name is an authentically Arabic one. It best translates into “home of the giving“ and therefore exemplifies what we stand for. We aim to enrich the lives of our patrons, employees and community by giving them the opportunity to experience art in all of its forms, thereby provoking thought and dialogue. Founded in 1998, Dar Al-Anda rapidly made a name for itself as a haven of fine arts emanating from the region. It has since then continued to build upon that legacy while staying true to its raison d’être. 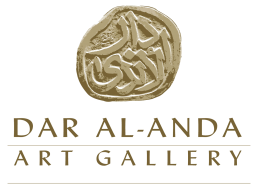 While still a gallery at heart, Dar Al-Anda also promotes and exhibits art in the auditory, visual and sensory forms. A series of musical concerts, literary events and cultural activities has fostered a devoted and growing group of advocates for the impact that Dar Al-Anda hopes to achieve within the art community. Born in 1987, Thilo Remini is a Swiss photographer currently living in Amman/Jordan. After traveling the world, he studied International Development and obtained further education in documentary photography & photojournalism in Vienna/Austria. He would later become one of the few photographers to be embedded with a special unit of the German Army, following the deployment of his own brother to Afghanistan. Forgotten Life sheds a light on the story of a single mother and her four children living in Hebron’s H2 Zone in Palestine. In this isolated area, where radical Israeli settlers cause increasingly difficult living conditions for the majority of the Palestinian population, Nisreen’s family faces almost daily harassment, oppression and restrictions of movement. This portrait of a family tells about what it means on going through severe traumatic experiences and on overcoming these. With their peaceful stance, they maintain a glimpse of hope on a constantly shaking ground in a very unsettling region. born in 1985, Interested in the Bedouin life in Algeria. He participated in different photography exhibitions, and got his work published in some photography magazines. Started the work on this project in 2015, it revolves around portraits of Bedouin people in the Algerian desert. They have no homes and do not dwell in cities, considering the desert as their home, moveing from one area to anoth.er in search of basic life resources. bedouins as they get in the desert far from the city hustles.